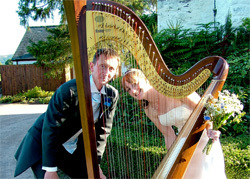 With over 10 years experience as a professional wedding harpist, you can look forward to a truly magical soundtrack to your day. The songs you choose for your Wedding will hold the memories of that day forever. I am passionate about harp music and enjoy learning all the requests that I get from my clients, ranging from old classics like Elvis, Van Morrison, The Beatles and Queen to modern bands like Elbow, Adele, Jack Johnson, Florence and the Machine, Savage Garden, Green Day, Coldplay, and many more. Please get in touch if you would like to hear your special song on the harp, to add that unique touch to your day. Also please get in contact if you have no idea where to start! So much is possible on the harp. It’s versatile, absolutely beautiful to listen to and visually stunning. To check my availability please send an email to elin@elinlloyd.com and I will get back to you within 24 hours, alternatively ring or text 07908 727 041. I then look forward to meeting you at our consultation and being the harpist on your Wedding Day. Up to 30 minutes of music to welcome the guests to the Ceremony, with a song of the Grooms choice to calm his nerves. Music with a modern touch while you and your guests relax with your drinks and have your photographs taken. I play right up until the Line-up into the Wedding Breakfast when I play another special song of your choice. Classical and Traditional music from my repertoire for the duration of the meal until the moment arrives for the speeches. For your convenience here is a printer friendly version of the wedding information on the website, a sample of my repertoire and Booking form. For all my repertoire updates, weddings, gigs, photos and news, please visit my harp Facebook and Twitter links or just listen to some lovely tracks here in my Music Studio.